We have had a cold, blustery damp week and I was getting sugar withdrawals. I had been too busy to bake and had avoided going out to the shops so consequently I didn’t have anything sweet in the house, not a block of chocolate, no biscuits or cakes to nibble on with morning coffee. This is not normal for me as my children will verify. Their delight in coming into my study or office was to raid the drawers in which were stashed my supply of nibbles including salted nuts, chocolate and sweet and savoury biscuits. I work better when I am munching and as my weight has never varied more than a kilo or two, my diet suits me. So when my family were coming for Sunday dinner recently I went into overdrive and cooked not only a chocolate cake but a Linzertorte as well. Talk about sugar overload: this was the ultimate in a sugar fix. The walnut and caramelized citrus cake with chocolate ganache is superb cut into small pieces to have with coffee and the jam tart: this was pure heaven. I took pity on my nephew who is studying and sent him home with a large piece of each to get him through the next day while sitting at his desk but there has still been enough for me this week. I am thinking of hiding the last piece of Linzertorte from my husband but he knows all my hiding places. I managed to snaffle the last piece for the photo. I will share this recipe as it is the easiest torte to make and so adaptable that you can use any type of nuts and jams you have in your pantry and it will still taste divine. I used almond meal as I had already used my walnut meal in the chocolate cake. I didn’t have raspberry jam but had a small amount of homemade strawberry jam and topped it up with homemade blackberry jam, which was just as delicious. I blended the ingredients in my food processor makes it quicker but it is just as easy but slower made by hand. As I had a small amount of pastry left over, I have made biscuits sandwiched with jam to consume later in the week. Timing: Pre heat oven to 180°C / 350°F when you have formed the lattice pattern over the jam. Toast the almond meal in a frying pan over a moderate heat, or in the oven, until it is lightly coloured and gives off the lovely toasty smell of roasted nuts. Remove from the heat and allow to cool before using it. Blend the almond meal, sugar, cinnamon, cloves, lemon rind, flour and baking powder in a food processor. Cut the butter into small pieces and blend into the dry ingredients to make fine crumbs. You can do this in the processor or by hand. Add the egg yolks and blend together. You can do this gently in the blender or by hand in a bowl. It is a dry mixture and tends to want to crumble. Rest the dough in the refrigerator for about 30 minutes to one hour. On hot days, if the dough becomes too soft, just refrigerate it for a while. Lightly grease a pan that has a removable base. I use a long 34cm x 11 cm pan, but a square pan or a round 23 cm pan works just as well. Cut off about ⅔ of the dough and roll it out thinly until about 2-4 mm thick. Don’t worry if it won’t roll out just pat it into the pan and up the sides. Place the torte on an oven tray to keep it stable. Spread the jam over the pastry. I used the strawberry jam and then topped it up with the blackberry jam. Refrigerate this while you roll out the top sheet of pastry. Roll the remaining pastry out until it is also 2-4 mm thick and cut it into thin strips. Place the strips across the top of the jam in a decorative pattern. Diagonal works well to form a lattice pattern. Refrigerate to rest the dough for about 30 minutes. Place the torte into the oven and bake for about 25 minutes until the pastry is golden and the jam starts to bubble. Remove and cool in the pan before removing the tart. Do this before it is completely cold or it might stick to the sides because of the jam.Dust with icing sugar and serve with ice cream or crème fraîche to cut the sweetness. This entry was posted in Cakes and Biscuits, Food, Uncategorized and tagged almond meal, blackberry jam, Desserts, Linzertorte, strawberry jam, sweet tarts on June 28, 2016 by lorikeetlady. By mid-morning I am wilting under the influence of a heat wave in Brisbane with temperatures reaching 31°C. My coffee habit is entrenched but instead of hot coffee I make myself a Frappé Coffee using chilled brewed espresso, a small amount of low-fat milk and ice blocks. It is delicious but I still feel the need for something sweet to nibble on. There is no ice-cream in the freezer and no sweet biscuits. I am not the only thing in my kitchen looking the worse for the heat. A solitary home-grown lady finger banana lies in the basket looking particularly unappetising with its blackened skin. The heat has probably caused it to over-ripen which is why both Andy and I have avoided eating it for breakfast. I don’t like waste and I need a chocolate fix so the only thing to do is make some chocolate and banana cupcakes. Within 30 minutes I am sitting under the fan on my deck, newspaper in one hand, Frappé Coffee on the table and I am taste testing my fresh batch of delicious cupcakes. I decided to make this recipe as it uses canola or light olive oil rather than butter and my husband can then justify eating them without worrying about his cholesterol levels. It is also easy because it doesn’t need a mixing machine. Preheat the oven to 180°C (350°F). 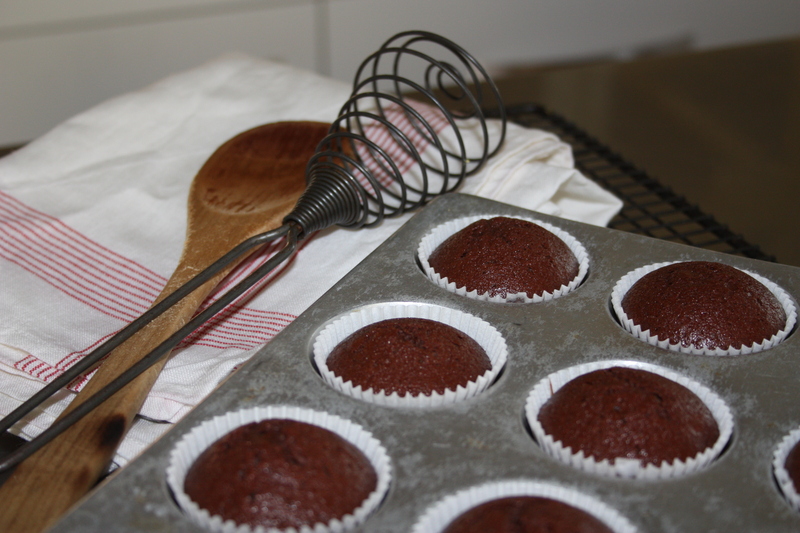 Place small muffin paper cases into muffin tins or lightly butter the muffin trays. In a large mixing bowl, blend the sugar, flour, cocoa, salt, and baking powder. In another large mixing bowl, blend the egg, the smashed banana, the milk, oil and vanilla. Stir this mixture into the dry ingredients and blend well. 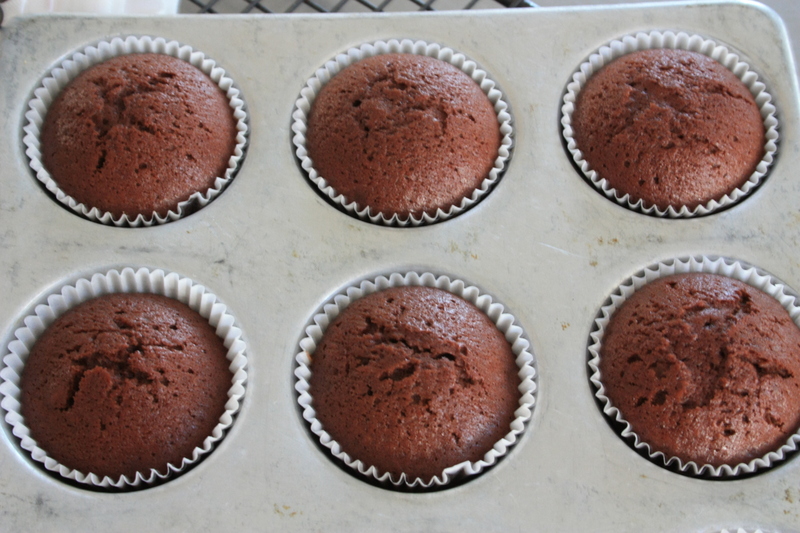 Pour the batter into the muffin cups ¾ full or to the top depending on how rounded you want the rise to be. Cook in the oven for about 15 minutes until a cake tester comes out clean. If using large muffin pans you might need to cook them for about 20 minutes. Remove from the oven and allow to cool on a wire rack. These cakes were so nice they didn’t need to be iced. The mixture makes quite a lot of little cakes, about 20. By the time I sent some over to my grandson for pre-school, given my parents some for their morning tea, Andy and I had just enough left for a couple of days. I think the oil keeps them lovely and moist, and they keep in the fridge for a few days. This entry was posted in Cakes and Biscuits, Food and tagged banana, chocolate, cupcakes on October 30, 2014 by lorikeetlady. These petite cakes are a delightful way of recalling a french holiday. I needed a reminder of my time in France and decided that Madeleines with all their associated history would be just the treat to bring memories back. I also wanted to use the silicone miniature Madeleine molds I bought in Paris. The very sound of the word Madeleine brings memories of holidays in France where my husband and I would sit in a café, sipping a coffee and indulge in one of these light irresistible cakes and watch the world pass by. These buttery little cakes are so delicious and are terribly easy to make (a type of génoise gateau). Perfect for busy cooks. This mixture does not contain any rising agent. It is the shock of cold to hot that assists the rising. The trick is to allow the batter to rest and to chill it. This is what makes it such a perfect cake. If you know you are having a girlfriend drop by either later that day or the even the following morning you can make the batter up, then place it in the fridge. When you are ready to cook them, make sure the oven is hot and then just pull the batter out of the fridge, scoop it into the molds and stick them straight into the hot oven. Voila. 10 minutes later you have beautiful freshly baked cakes to impress your family and friends. Like any small cakes, they are most delicious eaten the day they are made but if there are any left over they taste wonderful the next day, particularly dipped into a cup of coffee or tea. Preheat oven to 180°C (355°F). If not using silicone molds, butter the Madeleine tins well with melted butter. 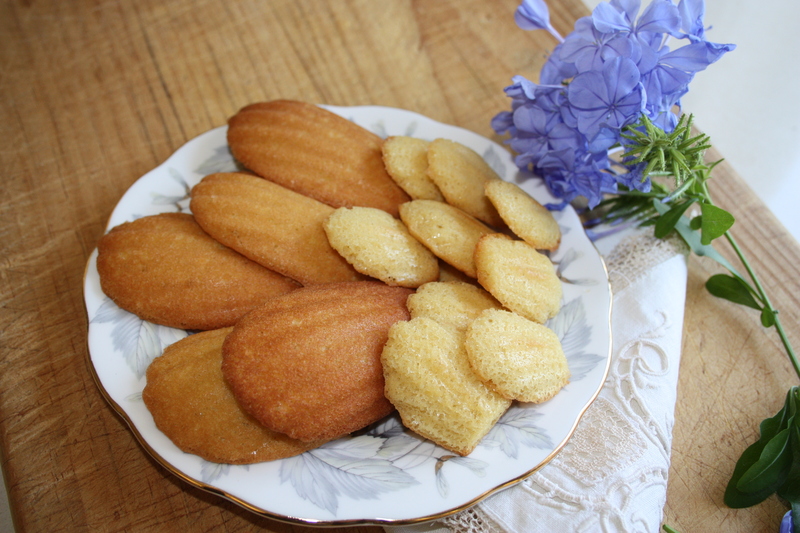 This mixture makes 12 – 20 Madeleines depending on whether you use the miniature or traditional size molds. Melt the butter over a gentle heat and allow to cool. Put sugar and eggs in a mixing bowl and beat together until the mixture forms a thick mousse. Add the vanilla to the mixture and blend well. Other flavourings can be used. Fold in the sifted flour and using a wooden spoon or spatula, mix well. Fold in the melted butter and blend well. Cover with plastic wrap and refrigerate for 1 hour and even overnight. Remove from the fridge, divide batter between the molds filling them about ¾ full. The fuller the shell, the rounder the hump on the cakes will be. Cook for about 7-10 minutes until golden. Remove from the pans immediately and allow to cool on a rack. Make a cup of coffee or tea pick up a cake and sit back and enjoy. This entry was posted in Cakes and Biscuits, Food and tagged Madeleines on October 27, 2014 by lorikeetlady.